Today brings you Sarah from Atlantic Atlantis. I really enjoy reading Sarah's blog, she always has something intelligent to say and is a great crafter, too. Sarah probably lives in the bit of Canada that is furthest away from where I am staying at the moment. I guest posted for Sarah a little while back, so I got cheeky and asked if she wanted to write something here while I was away. And she did! Yay! She decided to share her thoughts on art journalling. Over to you, Sarah! Hi everyone! My name is Sarah and I'm visiting from Atlantic Atlantis. 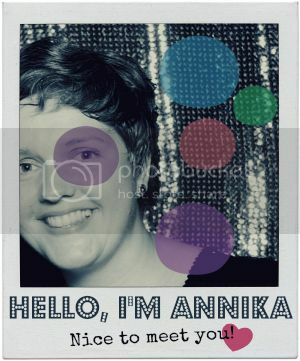 Sweet Annika asked me to guest post for her and I am truly honoured! She did a post for me last month (did you read it?!) and I am happy to return the favour and write a little something for her. One of my favourite things to do when I'm alone with my thoughts is art journaling. Whether I'm alone in bed, or sitting on a bench surrounded by strangers, journaling gives me a chance to be alone with my thoughts. It is the simplest of pleasures, but truly I always feels a thousand times better once I've completed a page of doodles and words. If this sort of stuff tickles your fancy too, maybe you should check out An Illustrated Life by Danny Gregory - such inspiration! The best thing about art journaling is that it's JUST FOR YOU. So what if something looks crooked or silly? Thank you for this inspiration, Sarah. I like the view outside your window! The only time I ever draw or doodle seems to be when I am in a boring phone call at work... Journalling would definitely be a better way to try and be artistic! This is a really lovely post - has really encouraged me to maybe give art journalling a go... if only I could draw that well!